Located just off Highway 101 and a short drive east of Chapleau, Ontario awaits Ivanhoe Lake. 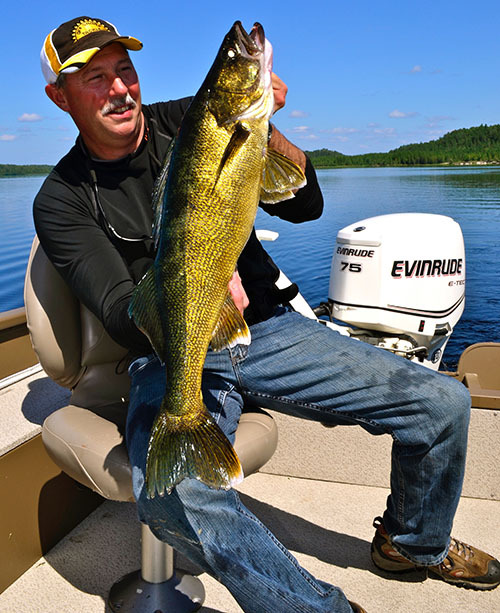 Ivanhoe Lake has a rich sport fishing history and is well known among locals for being a "walleye factory" bulging at the banks with eating sized fish. 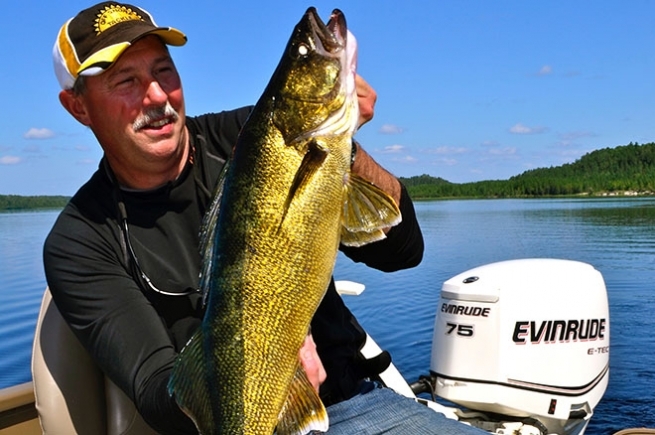 What even the locals don't fully understand is Ivanhoe Lake also produces staggering numbers of trophy class walleye. Every spring when the walleye run up the Ivanhoe River to spawn, lucky anglers find themselves face to face with trophy class walleye. After the spring spawning run however, those big walleye seemingly evaporate. Last August I was invited to fish Ivanhoe Lake as the guest of Garry Litt, the owner of Red Pine Lodge, near Foleyet, Ontario. In visiting with Garry I discovered that not only does Ivanhoe Lake have a great population of walleye, it's also well known for producing lake whitefish. The second I found out Ivanhoe Lake produces whitefish, I knew the lake would probably also produce ciscoes and could potentially be supporting an overlooked open water trolling bite for trophy walleye. The biologist in me knows that lakes that have whitefish also tend to support another soft rayed fish known as ciscoes. Both ciscoes and young whitefish are a favorite open water forage of walleye because these bait fish don't feature hard spines and scales that are difficult for walleye to digest. Normally these open water trolling bites start to set up in mid to late summer when forage fish form into huge schools and suspend in the water column over the deeper portions of the lake. Warm summer weather causes the lake to stratify and for cooler bands of water to set up midway in the water column. Forage fish tend to favor these cooler bands of water and walleye suspend right along with them. The walleye that roam around in the middle of the lake following schools of ciscoe and whitefish aren't the run of the mill fish. These "open water" walleye tend to be adult fish that have adapted to feeding on larger and more protein rich forages. Walleye can be expected to be found following the roaming schools of ciscoes all summer long and deep into the fall. Because the bait and the walleye are constantly on the move, trolling is one of the only practical ways to target these fish. Deep diving crankbaits are the logical choice because these lures can be easily manipulated to reach just about any target depth by simply adjusting the lead length they are fished on. Secondly, crankbaits readily adapt to being fished in combination with in-line planer boards like the famous Off Shore Tackle Side-Planer. Using planer boards and crankbaits anglers can easily target specific depth levels in the water column and at the same time reach out away from the boat to cover more water. The most productive crankbaits for open water walleye trolling tend to be deep diving minnow baits including the famous Reef Runner 800 Series, Rapala Tail Dancer TDD11, Rapala's Deep Husky Jerk 12, Bomber's 25A and the Yo-Zuri Deep Crystal Minnow. All of these lures are similar in that the body shape is long and narrow, closely imitating open water forage species and they feature a significant diving lip that allows these baits to fish down 20 feet or more. On my trip to Ivanhoe Lake it was the Reef Runner 800 series that proved to be the most productive crankbait. Fished back 150 to 200 feet on 10# test monofilament, this bait runs 25 to 28 feet down. For a full Dive Curve that shows exactly how deep the 800 Series Reef Runner runs at all lead lengths, check out the Precision Trolling Data, iPhone app, www.precisiontrollingdata.com. This app is sold through the Apple store and provides the diving depths of over 200 popular crankbaits. The same data is also available in a hard copy version known as Precision Trolling Data Stickers which are printed on vinyl and can be adhered easily to 3700 style tackle boxes. The key to catching open water suspended walleye is to first find them. I recommend identifying the deeper portions of the lake using a printed map or the mapping data provided on a combination sonar/GPS unit. Typically forage fish stack up in water from 30 to 50 feet deep over sprawling flats and these bait fish tend to suspend about half way down in the water column. With the help of sonar it's pretty easy to locate the schools of bait and also to mark any walleye that may be shadowing the bait schools. 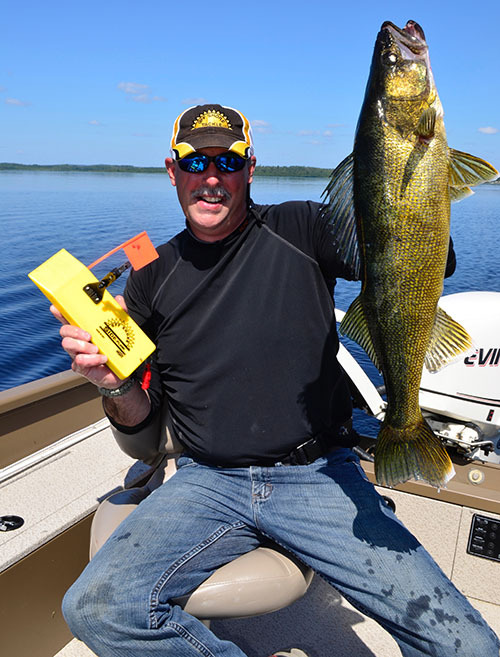 Don't bother to set lines or even start fishing until both bait and walleye have been located with the help of sonar. It's common in Ontario waters for both walleye and northern pike to suspend in the same areas as they both recognize the value of feeding on protein rich forages. In addition to big walleye, Ivanhoe Lake is home to some impressive northern pike and both will be caught trolling crankbaits in open water. Fishing with four people and setting out two crankbaits and two planer boards per side of the boat is a good starting point. With the help of four lines in the water, the process of sorting through different brand, model and colors of crankbaits can begin. On any given day the depth at which these walleye are going to be suspended can change. It's also important to note that the lures that walleye favor may change not only day by day, but sometimes hour by hour. The process of catching open water walleye on crankbaits boils down to the willingness to keep experimenting with lures, lead lengths, trolling speeds and lure colors until a productive combination becomes apparent. Once this pattern starts to become obvious, smart trollers duplicate the productive variables as closely as possible. One final tip is to consider using Tattle Flag kits on the planer boards. Tattle Flags are spring loaded flag kits that enable the flag on the board to fold down when a fish bites and is hooked. This simple function makes it much easier to read the planer board to determine strikes and also tips off the angler when a small fish is hooked or even if floating debris like a piece of weed fouls on the crankbait. 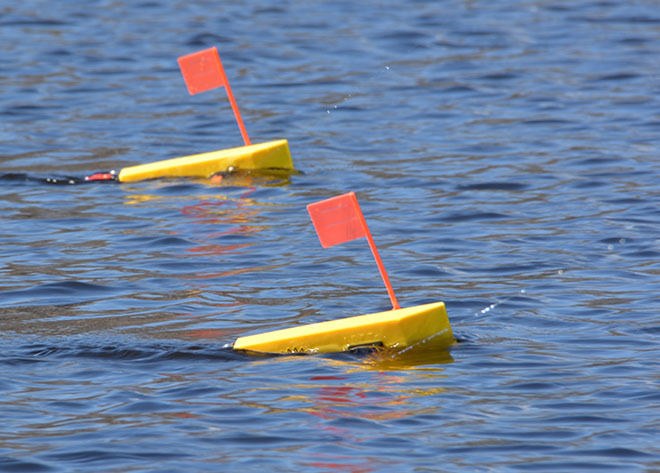 Tattle Flag kits are an aftermarket item that can be installed on an Off Shore board in about two or three minutes using just a phillips screw driver. 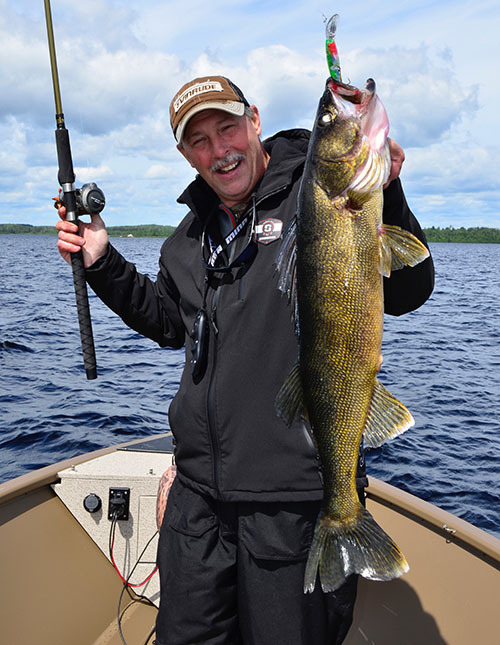 Ivanhoe Lake is only one of hundreds of noteworthy walleye fisheries in Algoma Country. Despite being on the beaten path, this gem of a fishery is unique in it's ability to produce not only eating sized fish, but impressive numbers of trophy class walleye as well. Red Pine Lodge, located right on the lake features cabin rentals, a lodge complete with American Plan and Housekeeping packages, a camp store, live bait, boat launch, gas station and RV park. Literally everything an angler could need or want is available right on the grounds of Red Pine Lodge. Red Pine Lodge also has outpost camps on the Ivanhoe River that provide tremendous spring walleye jigging action as well.